As we gear up for the 2018 Poppies, I've been polling various folks on the best Star Wars Black 6" figure releases of the year to ensure the best end up on the ballot. And one name keeps coming up over and over again - Tarkin. 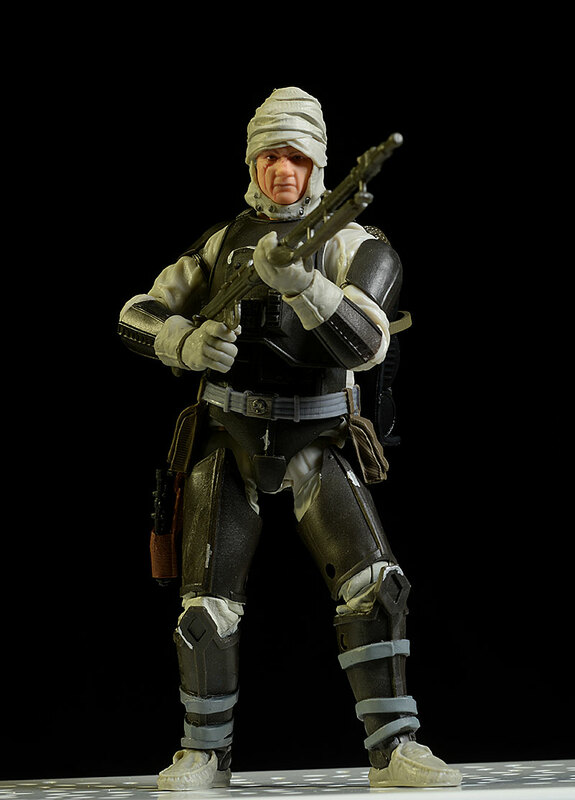 You thought I'd say Dengar, didn't you? Well, he's a close second, and that's a pretty big surprise to me. Even more surprising - we got two different scale Dengar's this year, both of them quite good. How often does that happen? 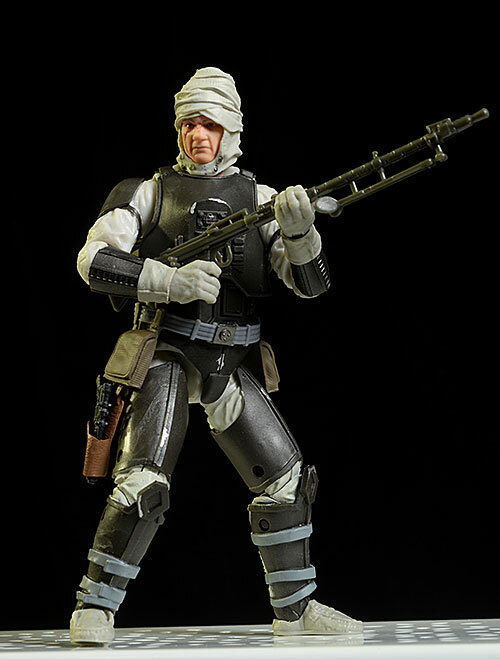 Dengar is not my favorite Star Wars character. He's not even my favorite Star Wars bounty hunter. Hell, he's not even in the top five. Something about his design just doesn't work for me, but I know he has his fans. 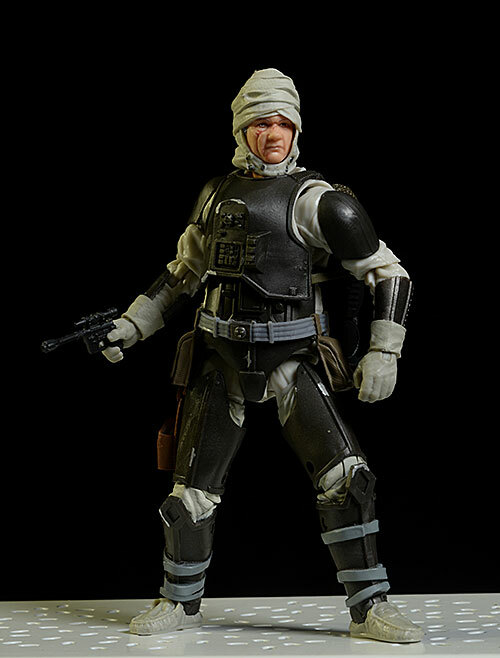 You can't have a complete set of bounty hunters without him, and while he might not be a favorite character, I know a great figure when I see one. The Star Wars Black 6" version has just started shipping, and will run you around $20 at most retailers. The boxes Hasbro uses for this line have a lot going for them. The large window shows off the figure well; the large number on the edge allows you to scan the pegs for the ones you're missing easily; and the packaging is completely collector friendly, requiring no damage in removing the figure and accessories. But my personal favorite aspect is the black and white ink style artwork of the character on the front. It looks terrific, and adds a lot of pizzazz to the otherwise spartan design. The amount of detail going into this series is really quite impressive, particularly at this price point. First, keep in mind the scale. 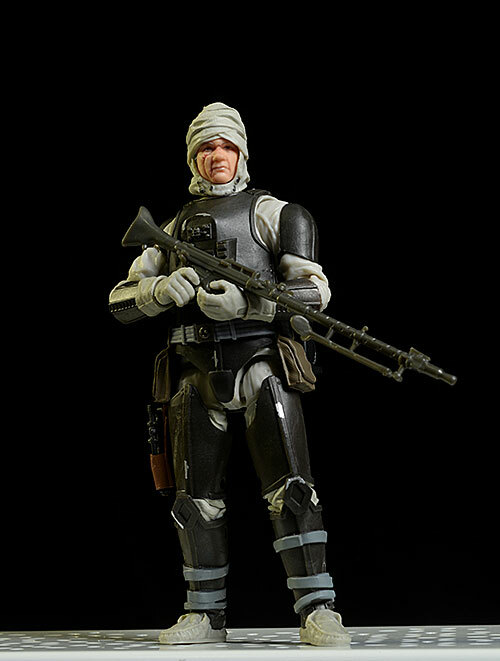 This is a 1/12th scale line, and Dengar comes in at about 6 3/8" tall. The detailed textures, the scarring on the face, the pock marking on the armor, all in this diminutive size, is really quite impressive. Mixing up the textures lends realism to the overall look. The wrapping on the head is more cloth-like, while the armor is clearly some sort of metal, and the exposed face looks like realistic skin. They've even given the holster a leathery look, while the belt packs mirror cloth. Minutia on the suit is sharply cut, and even the smallest detail is well defined. The entire sculpt works great with the design of the articulation as well, always a big plus. Is it a perfect likeness? Hey, it's a pudgy white dude with some serious scars. It certainly looks like him to me, although I'm betting the rabid fans will find a few nits to pick. One area where Hasbro has really improved with this series is the paint operations. Using some new techniques and increasing the quality overall has resulted in a much, much better looking figure. The small details are generally clean, and the work on the face - eyes, lips, skin, scars - is really impressive. The armor doesn't have a lot of operations, but there are a few used to add some wear and tear. These look fantastic in hand, where the scale works to their advantage. 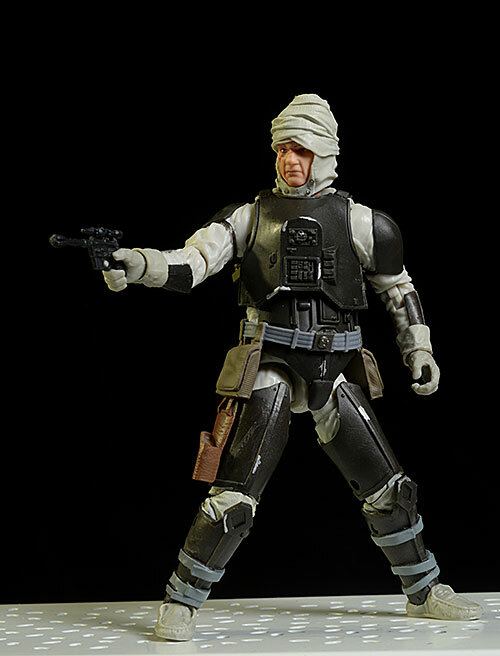 The overall articulation is another area for improvement for just about every figure in the Star Wars Black line up. 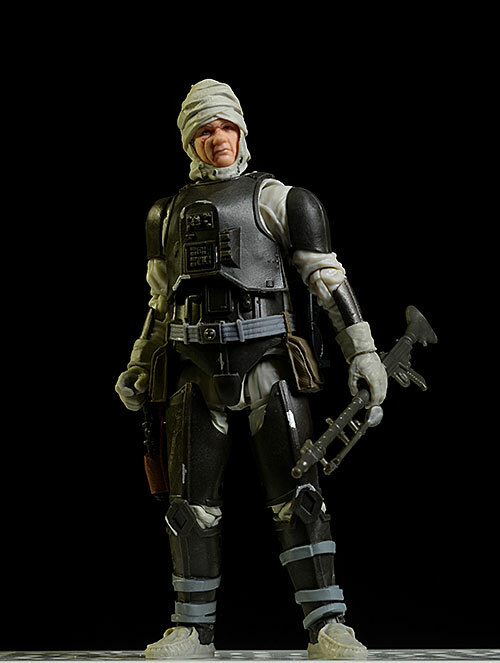 With Dengar, they've gotten creative in giving you plenty of joints, even with the armored costume. The neck is a bit restricted, what with the wrapping on the head and the high shoulder armor. Still, you can get a little tilt and lean. The rotating hinge shoulders, elbows, and wrists, work together to create good one and two handed gun poses, and some nice relaxed looks as well. The torso is the most restricted area of course, but you can turn him at the lower chest, and there's a minute amount of tilt and lean movement as well. The ball hips work great, and there's a cut thigh, double pin knee, and hinge/rocker ankle that allows for very deep stances. 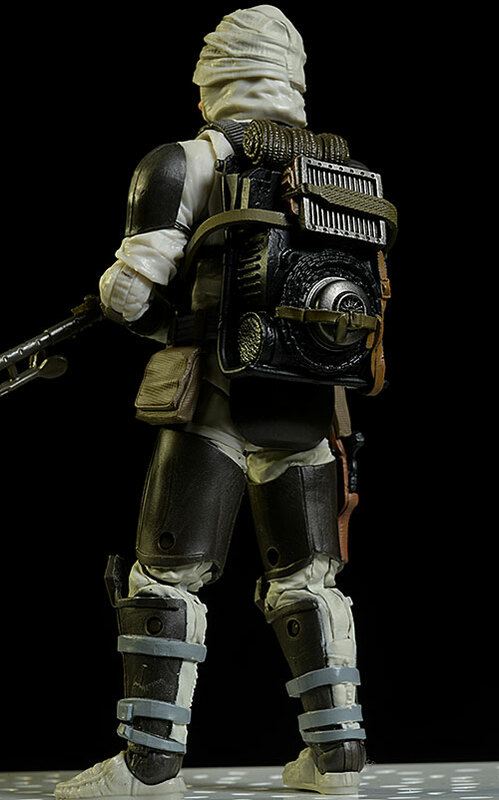 He comes with three extras - his small blaster pistol, his large blaster rifle, and his backpack. The pistol fits in his right hand, or slips into the soft rubber holster on his right thigh. The larger rifle can be held in a plethora of one and two handed poses, and both sport nice sculpts for this scale. 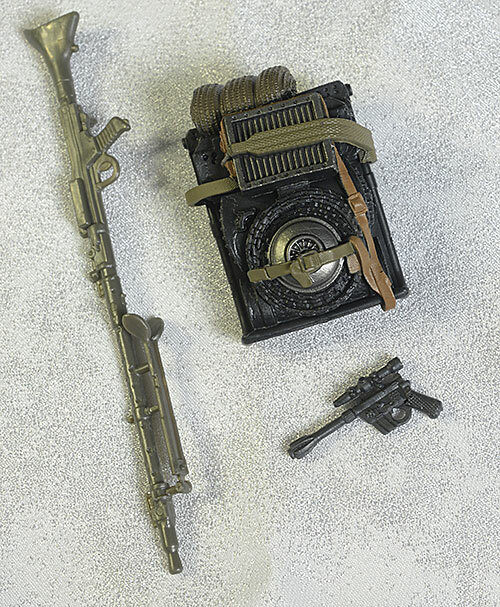 The paint is basic - the large gun is cast in gray, the small in black - but there is some wear and tear added to the smaller weapon. The pack is much more complex, and has a few more paint ops. It attaches to his back via a large peg, and stays in place when handling. It's a nice tight fit too, and really adds quite a bit to the overall look of the figure. He might not be the Brad Pitt of bounty hunters, but he's a ton of fun. The great articulation goes a long way to creating a figure with lots of posing and re-posing potential, and kids will have a great time playing with him alongside Bossk, Boba Fett, and 4-LOM. You can find these guys for as little as $18 at some retailers, and the level of quality has really risen over the last couple years. You're getting a better value now, thanks to the improvements in sculpting, articulation, and paint. The Star Wars Black series of bounty hunters is now complete. 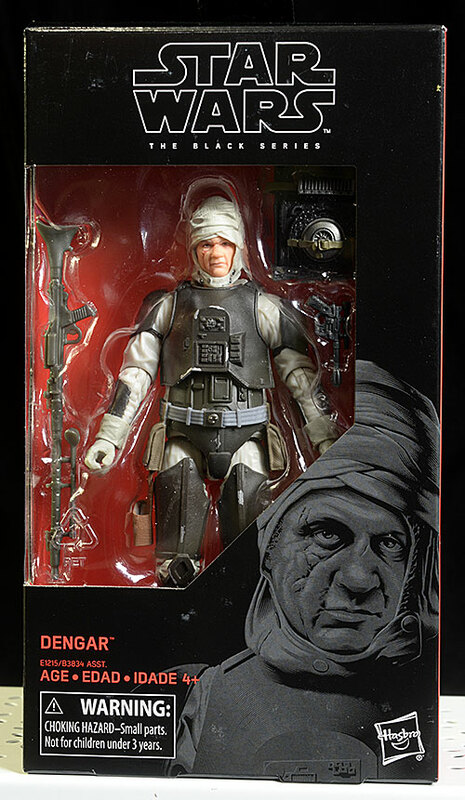 We've gotten great versions of Fett, 4-LOM, Zuckuss, IG-88, Bossk...and now, Dengar. They've wrapped things up with a pretty bow, just in time for Christmas. While I'm not a huge fan of the character, the figure turned out terrific. In fact, I almost went the full four stars, but was barely held back by a couple minor nits. 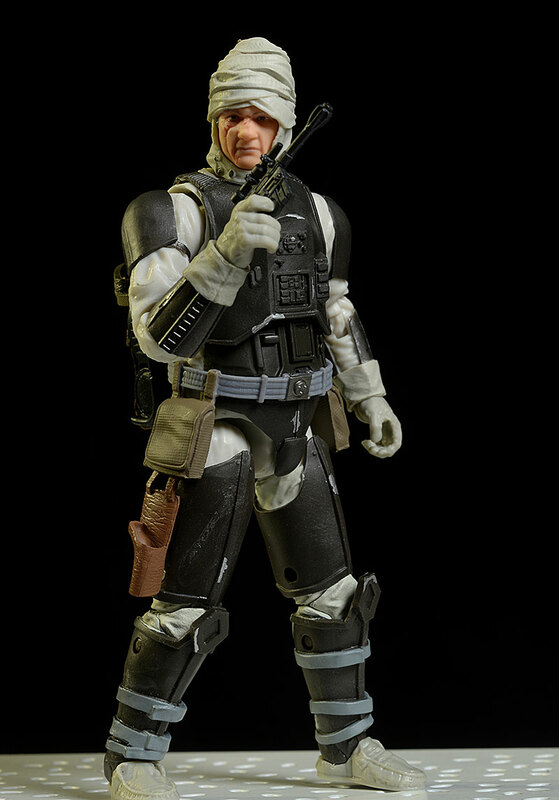 He's a great addition to the series, and will look terrific on your shelf - or in the sandbox. - has him for $25. - Entertainment Earth comes in at $22. 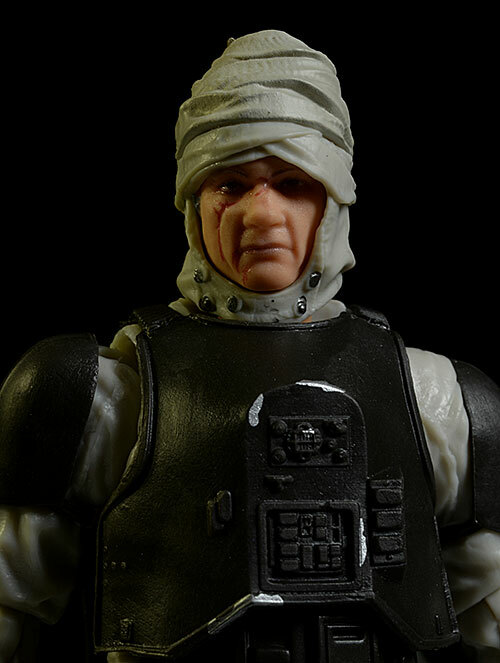 Another recent - and excellent - Dengar is the sixth scale version done by Sideshow. 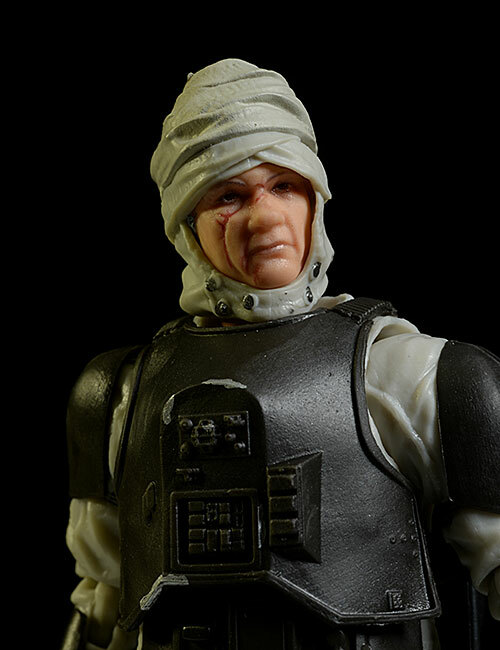 Other recent Star Wars Black figures include the Gammorean Guard, 4-LOM, and Lando Calrissian.